WEBCommentary(tm) - The Lone Ranger and Elizabeth Warren-Tonto: Looks Like They've Got Us; What You Mean Us White-Eyes? 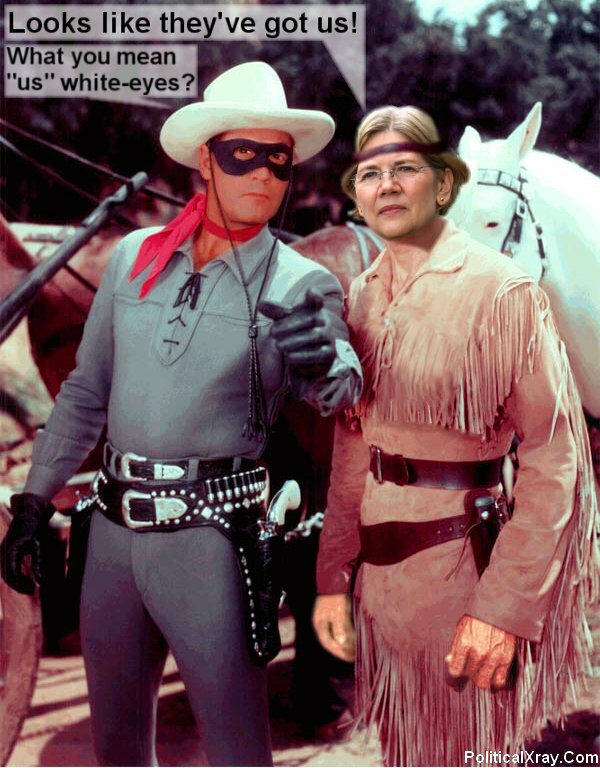 The Lone Ranger and Elizabeth Warren-Tonto: Looks Like They've Got Us; What You Mean Us White-Eyes? Can Scott Brown's 32/32 "Brownness" trump Elizabeth Warren-Tonto's 31/32 White-Eyes ethnicity? In response to polling surges by her opponent (Republican incumbent Scott Brown) in the 2012 race for the Senate in Massachusetts, Elizabeth Warren-Tonto, noted Native American, Harvard Faculty Member, and Senate Candidate, said to her Lone Ranger sidekick: "It looks like they've got us," to which her sidekick replied, "What you mean 'us' White-Eyes?" She replied, "You mean all 1/32nds?" When asked about the controversy, her opponent, Scott Brown, pointed out that he had never sought to interject ethnicity into the race: "I never tried to play my 'Brownness' card even though I'm 32/32 Brown."